Hello, and thank you for your interest in Belle Vie Photography for your baby’s first portrait session. First of all, CONGRATULATIONS! You are welcoming a new little life into your family and are overcome with joy, excitement, apprehension and most importantly, love. You have been planning, preparing, learning, worrying and are possibly completely overwhelmed with how your life will soon be changing. With so much to worry about and prepare for, it’s important you entrust your newborn portrait session to an experienced and caring photographer. One who is trained in newborn safety and comfort, and one who will design your newborn session especially for you and your unique style. If you have already chosen Belle Vie Photography for your baby’s first portrait session, thank you. If you are still looking for the perfect photographer, hopefully this guide will be helpful and infrormative. First and foremost, I absolutely adore babies. From their sweet little toes to the soft hair on their darling heads. Every one is beyond beautiful and immeasurably precious. So is the bond between parent and child, what I feel is one of life's greatest treasures. As a mom I know that bond and understand the importance of capturing the first days of a baby's life. I have been photographing newborns since 2012 and have cherished each and every session. I have extensive training in newborn safety, comfort, posing, positioning and styling. Your baby's safety and comfort are my primary concern. Every baby is different and although they are brand new, they have already developed preferences and have defining personality traits. Part of my job as your newborn photographer is to learn those traits and preferences to photograph your baby naturally, comfortably and beautifully. I look forward to meeting the newest addition(s) to your family. Newborn sessions are conducted in the first two weeks after a baby's birth. During this time babies primarily eat and sleep making all of those cute little poses possible. If you are planning a newborn session for your baby, contact me early so we can schedule your session within your baby's first two weeks. 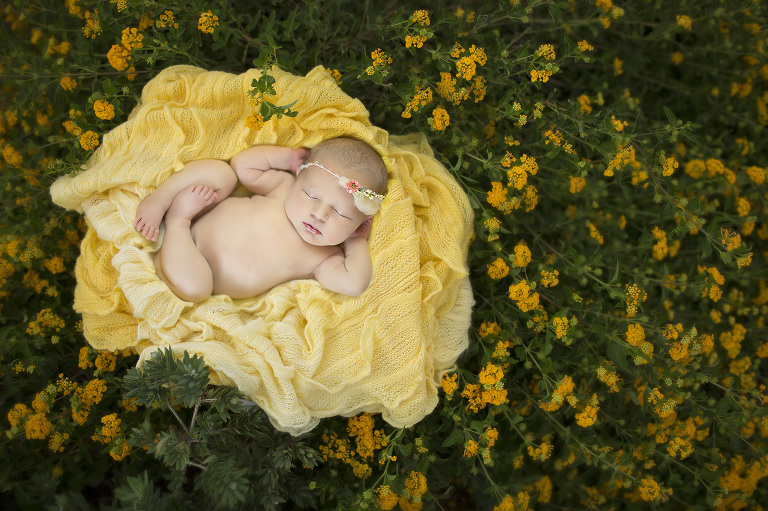 Sessions are conducted primarily in my studio, however I do offer outdoor newborn sessions if weather conditions are above 80 degrees with no inclement weather or wind. Sessions last from 2 to 4 hours. This will depend on how well you prepared your baby for the shoot and how your baby does with the posing. My primary concern is that your baby is comfortable, cozy and safe during posing. The first thing to expect is that your baby likely will not act like they do at home. I often have parents tell me their baby sleeps all the time, yet during the session the baby is very active, upset, or awake throughout. This is to be expected. Everything about a newborn session is different than what A baby has grown accustomed to in the short time since their birth. Different smells, different sounds, not enough sound, different temperature, not being held or left to sleep continuously...these are all things that will disrupt your baby. My job is to make them as comfortable as possible, but it will never be like home. Some babies adapt just fine and sleep soundly through the dressing and posing. While other babies cry the instant they are taken from mom and won't sleep until they are with her again. This is all part of the process so please don't worry. If your baby will not settle and I don't feel I've gotten enough images, or variety of images, I will end the session and we will continue the session on another day. Your newborn session will consist of numerous position and prop changes to offer the most variety in your images. The variety will depend on your baby and how you have prepared for your session. You may be asked for assistance during your baby's session, for safety purposes, however please do not be offended if I do not. Some baby's are acutely aware when mom is close and it may inhibit their ability to calm down and sleep. Your baby will likely need to eat at least once during your session. During this time we don't want to rush, just let your baby calm down and eat. Don't worry about the time it takes, that time is factored into my sessions. If you are bottle feeding, come prepared with plenty of formula and bottles. If you plan on taking photos with your baby, come prepared with several changes of clothes. Babies are generally naked and accidents happen. I prefer to photograph mom wrapped with plain fabric and dad shirtless to show the beautiful skin-to-skin connection with your baby, however if you are uncomfortable with this, please bring solid colored shirts free of logos. If siblings will be participating in the portrait session, please plan on them only being present during the last 30 minutes of the session. You do not need to worry about bringing a thing to your newborn session. 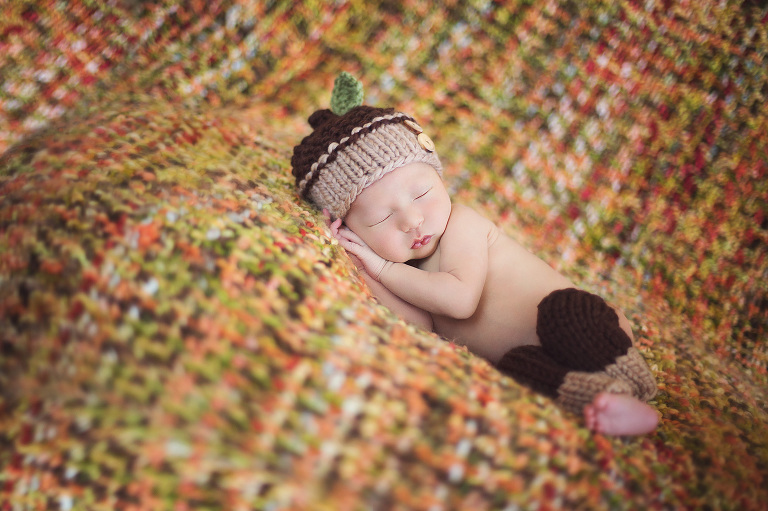 I have hats, crowns, wraps, blankets, baskets, buckets...plenty of props to design a newborn session you will love! If you have something special you would like to bring, wonderful! Let me know prior to your session so I can create a set-up with it in mind. One of the most common items to bring are baby blankets a family member has made, but I have had clients bring special toys or baby books. One client brought a baseball mitt and ball her husband played college baseball with. If you have a favorite season, if your baby was born close to a holiday or you have an obsession with Harry Potter or unicorns, let me know! I want your session to be unique and magical. These are some of the first images you will have of your new family member. Your little one is incredibly special; I want your session to be worthy of this amazing new little person. If you have a baby boy, PLEASE wait until after your newborn session to have him circumcised. This can cause extreme discomfort to your baby and drastically inhibit my ability to soothe and position him into a variety of poses.